July 7, 2014 Update: After Arthur came through our Wilmington and New Bern service areas, both the Red Cross and our partner agencies reported only power outages and no major damage. As of Friday, July 4, power had already been restored to most areas, and as a result, our partner agencies did not need to provide any extra assistance due to the storm. Thank you to the Red Cross, our partner agencies, and our supporters for your thoughts and preparation during the first hurricane of the season. As Hurricane Arthur approaches our coast, we are preparing to act as first responders in eastern North Carolina. The current path of the storm will likely affect the service area of our New Bern and Wilmington Branches including Carteret, Craven, Jones, Onslow, Pamlico, Brunswick, Columbus, New Hanover, and Pender counties. We have taken inventory of disaster relief product and secured additional equipment at our New Bern and Wilmington Branches. We have contacted our primary disaster relief partner agencies in the area to inform them of our preparations and ability to assist if Arthur causes major damage in their local communities. And we’ve also been in contact with local emergency operation centers, and will remain in direct communication with them as the storm progresses. 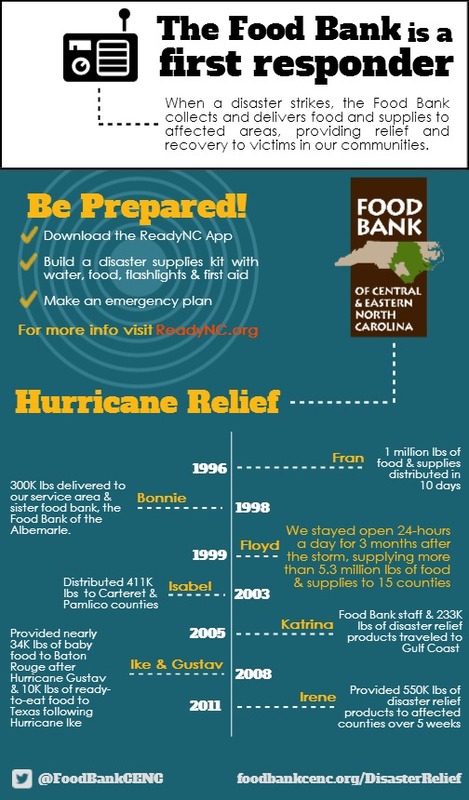 Check out the infographic below for information on what you can do to be prepared and our history in disaster relief efforts. We are at the ready. Stay tuned for developments, and stay safe! For more information on the Food Bank’s disaster relief efforts, visit our website. Be prepared! Visit ReadyNC.org for NC disaster relief information.